From Bix Beiderbecke and Louis Armstrong to Herb Alpert and Chuck Mangione, take a look at the genesis of pop trumpet. 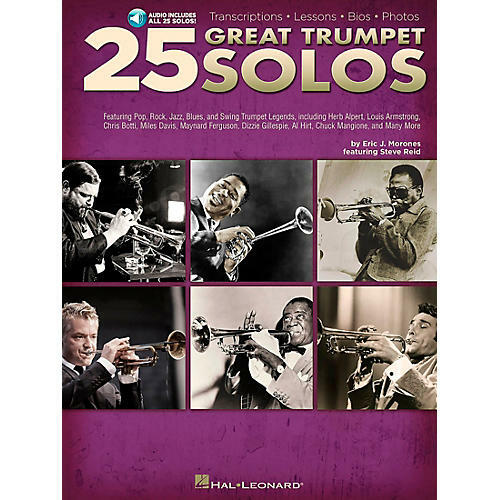 This book/Online Audio package provides solo transcriptions in standard notation, lessons on how to play them, biographies, instrument information, photos, history, and more. The accompanying Online Audio contains full-band demo tracks and accompaniment-only tracks for every trumpet solo in the book. For PC and MAC users, the Online Audio is enhanced with Amazing Slow Downer software so you can adjust the recording to any tempo without changing pitch! Songs include: Cherokee (Indian Love Song) • Cherry Pink and Apple Blossom White • Does Anybody Really Know What Time It Is? • Feels So Good • Hello, Dolly! • Holding Back the Years • MacArthur Park • Misirlou • Penny Lane • Salt Peanuts • So What • Zanzibar • and more.